Schwinn MY16 130 is one of the best upright bikes in the middle class. It is equipped with advanced technology and is especially good at the pedalling feeling and the console functions. 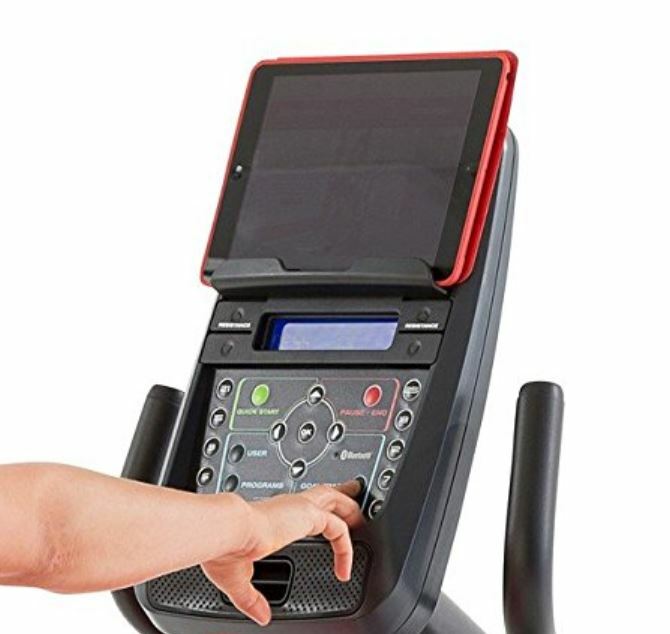 If you want to maintain a healthier lifestyle, to enhance your stamina and muscular strength or for a rehabilitation therapy, Schwinn MY16 130 can offer you all. Let’s have a look at this wonderful bike. 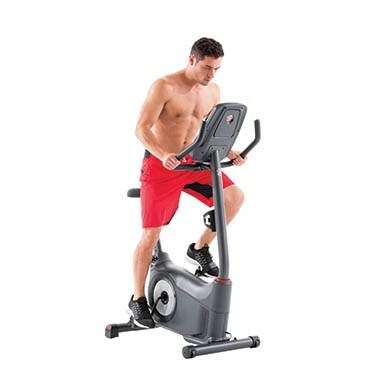 Schwinn provides a wide range of exercise equipment, including recumbent bikes, upright bikes, classic cruiser, airdyne bikes, ellipticals and treadmills. All have a smart design and integrated technology. Overall, Schwinn Fitness is a Worldwide trusted brand that only provides quality products. Schwinn MY16 130 is an upright bike – the kind of bike that is safe and effective. It is designed like a real bike with a high seat, pedals under the seat and two handlebars in front of the seat. This design gives you an outdoor recycling feeling which is interesting and challenging enough to stimulate your inspiration, and you might work out for hours without notice. An upright bike is designed for serious training, especially great for improving your cardiovascular and musculoskeletal health. As a stationary bike, an upright bike can support your joints well with less stress on the knees and ankles. An upright bike also has a small footprint, so you can save a lot of your home space. Schwinn is always known for their bulky exercise bikes. However, when it comes to Schwinn MY16 130 upright bike, it seems that Schwinn had done well in design to make the bike compact but still has many features integrated. Indeed, the dimensions of the bike are 41 W x 23 L x 55 H inches (104 W x 58 L x 141 H centimeters) and the weight is 59 pounds (26.7 kilograms) – it still requires more space than other upright bikes that I’ve reviewed. Due to the firm build, the bike can support up to 300 lbs users, and suitable for most of the height. And the bike gives you the solid feeling when you cycling, no jerky, no out of control movements, regardless of speed or resistance level. Comfortable seat with adjustable height. Comfortable handlebars with adjustable angle and integrated contact heart rate monitors. Advanced technology and a big console table that can maximize your workout experience. The assembly progress when the bike first arrives is hard and takes a lot of time. You might need an extra pair of hands to assemble it. The pedal design is made from plastic and the distance from the pedals to the crank is not so far that can make you uncomfortable and hurt. Most of Schwinn exercise equipment have dark grey powder coated outlook, and Schwinn MY16 130 is not an exception. 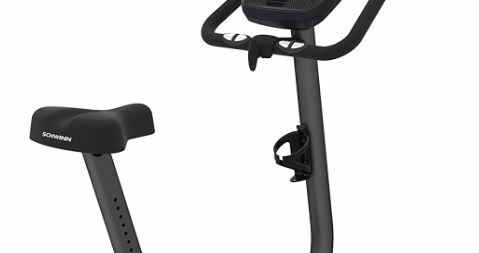 I personally find this color boring since every exercise bike uses it, however, dark grey colour can help the bike look high-classed and stand the test of time. Schwinn MY16 130 has a strong tubular frame, including a longitudinal bar and two front and rear bars. The longitudinal bar is a single piece, giving more sturdiness than a two-piece bar. The front and rear bars are attached to the main frame by bolts, making the bike more stable while pedalling. There are two levellers under the rear bar, which give you the ability to place firmly this bike on a floor that has variation. These levellers are made from rubber, making the bike not slide even if you’re cycling hard. There is a water bottle holder under the handlebar for your convenience while exercising. 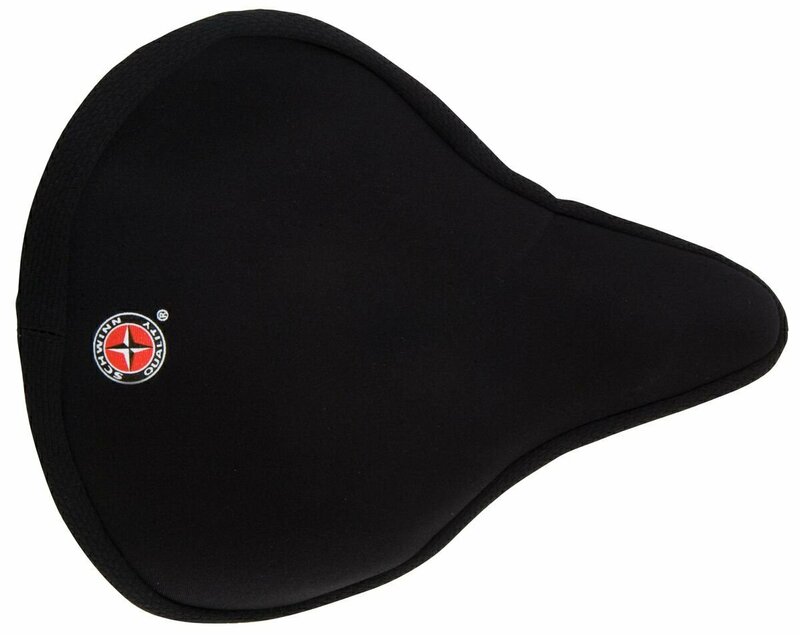 The seats of Schwinn’s machine are always comfortable as they are also well-known for their additional seat covers – if your current exercise bike seat is not comfortable, have a look at Schwinn seat cover store. In Schwinn MY16 130, they designed the seat simply but ergonomically. It is padded and is easy for exchange, but maybe it is quite small and not so soft. The seat can also be adjusted in the height to fit a wide range of user heights. Indeed, there are 12 high levels of the seat – you won’t need to worry whether your height will fit the bike. However, the seat can’t be adjusted horizontally. In compensation, you will have handlebars that can be adjusted in angle. You are assured that your hand can touch the handlebars easily. 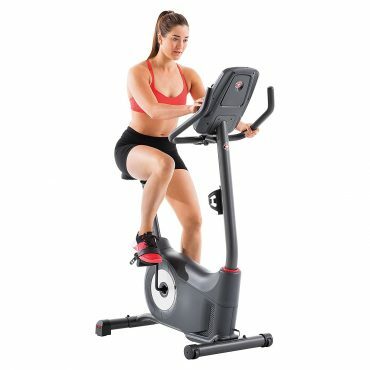 And, the seat doesn’t come with a backrest since your upper body will be forward and downward while workout – Schwinn MY16 130 is a machine for serious workouts not for entertainment like recumbent bikes though. The handlebars are in front of the seat and a little above the seat. It can be adjusted in angle to fit many postures and grasp styles. The handlebars are also rubber foam paddle to give you more comfort. There are integrated Hand Pulse Sensors for you to monitor your heart rate. By that, you can maintain your target heart rate. Measuring your pulse rate is an important tool for exercising correctly and efficiently. The more steady and prolonged the elevated heart rate is during the workout, the more fat is burned. This important piece of health data will help you better understand your health and fitness status. 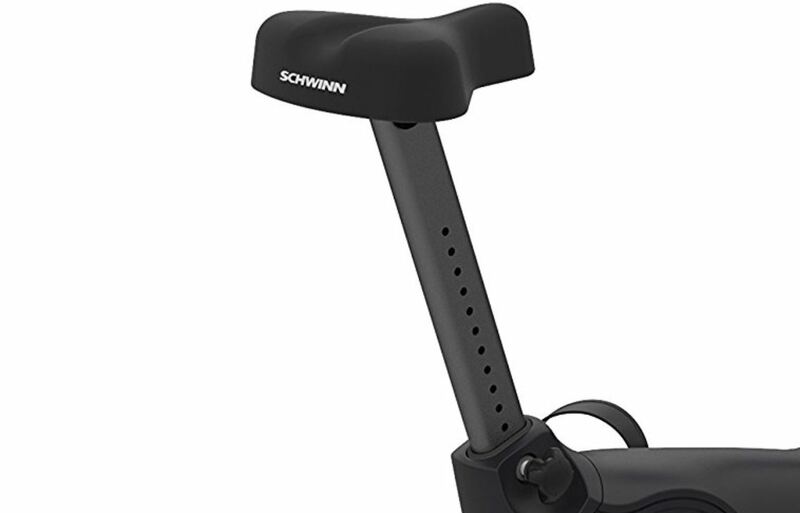 Schwinn MY16 130 has two pedals with adjustable foot straps in front of you to prevent any foot slippage when exercising, giving you proper alignment for efficient pedalling with ultimate control. The crank is one piece, thus, it cannot be as rhythmic as three-piece cranks. But it still smooth and quiet enough for your enjoyment of the workout or movie/music. However, the material of these pedal straps is plastic, which can make you hurt if you pedal by your bare feet. And the distance from the pedal to the crank is not so long, so it can interrupt your pedalling if your feet are oversized. 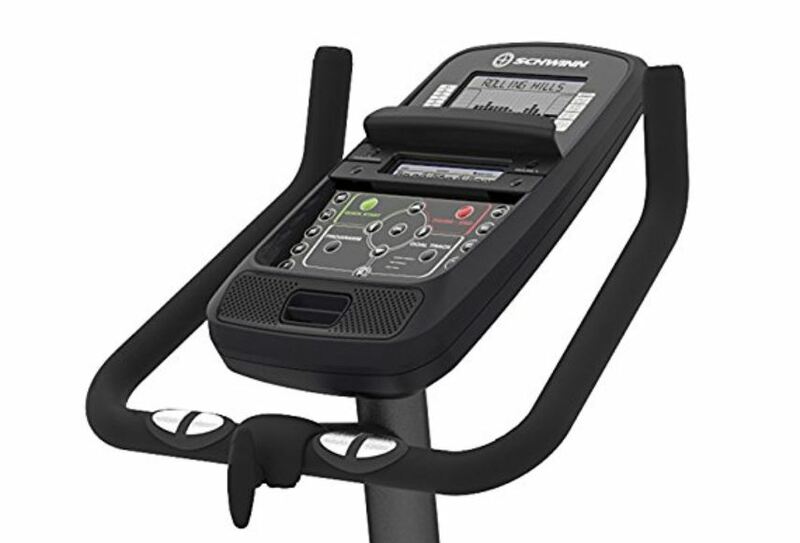 Schwinn MY16 130 is equipped with an advanced console table including two LCD displays. 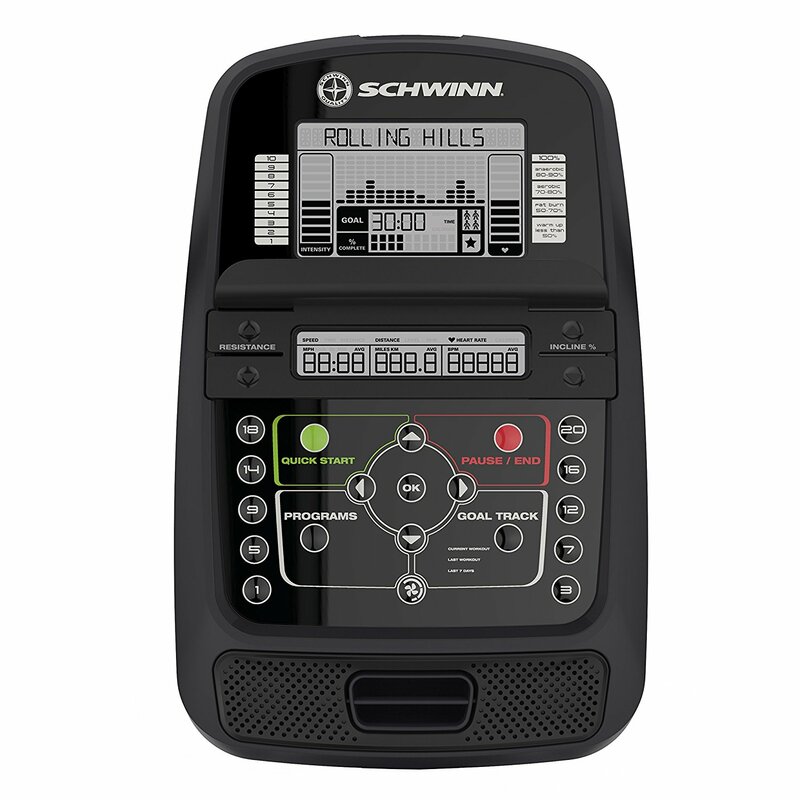 The console technology is the most special features on every Schwinn products, which makes them outstanding from other brand products. Two LCD displays give you real-time important information, such as program selection, resistance level, interval time, time, RPM, Watts, Distance and heart rate. You get results for 13 key workout metrics. You can easily change your practice program, speed and resistance level using the console. 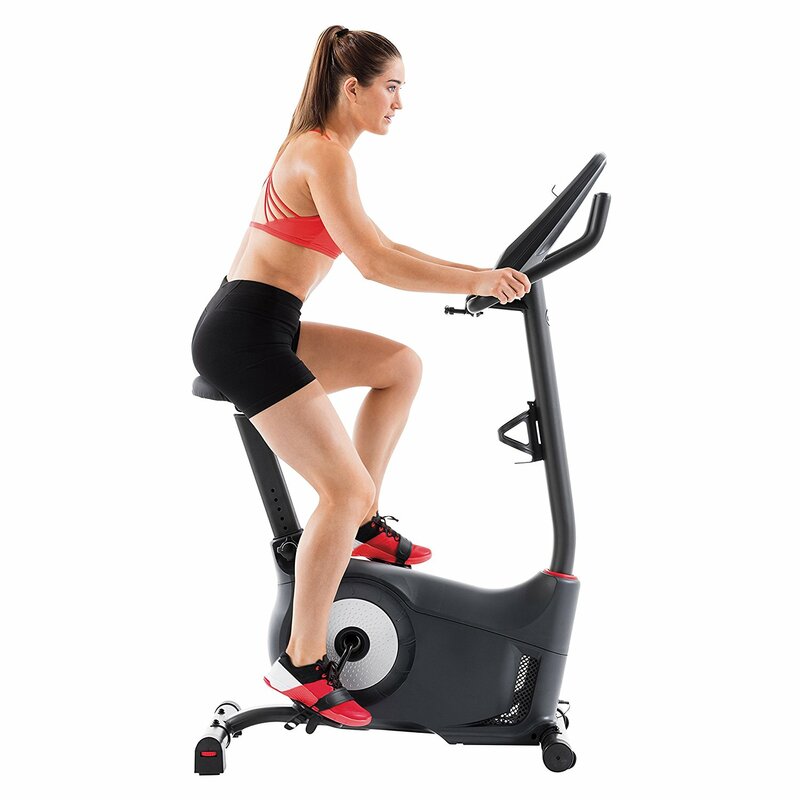 When you get used to this console and discover various functions, you will find this bike’s 22 programs and 20 levels of resistance are interesting that will keep you motivated and help you achieve your fitness goals. Trough this USB port, you can upload your progress to many different fitness tracking apps, such as SchwinnConnect, MyFitnessPal, GoogleFit, Apple Health, Endomondo, MapMyRun, to track your goal. 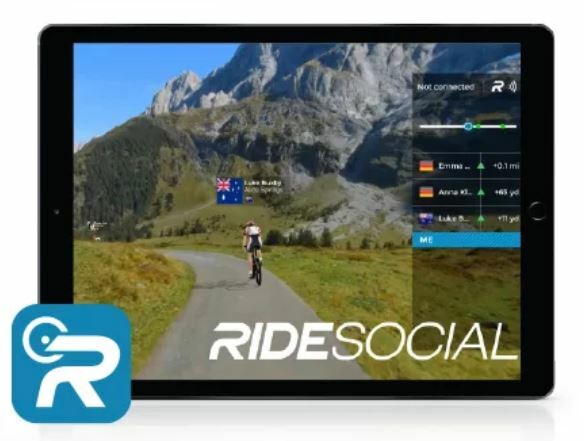 Or, to charge your tablet and place it on the tray on the console to enjoy movies or RideSocial App that can maximize the reality riding feeling. Furthermore, there are also adjustable fans on the console, always available to keep you cool during intense workout periods. That’s all about the bike design. With that advanced design, Will Schwinn MY16 130 provide you with a nice pedalling experience? Let’s find out in the following section. Flexibility in seat position. Each posture is great for a particular purpose. Firm, sturdy and smooth pedalling experience. Integrated fans keep you cool during the workouts. Console profile programs, additional apps, and integrated speakers make you enjoy your workout fulfilment. Literally, there are not many things to complain when it comes to the exercise experience that Schwinn MY16 130 provides you with. Only the seat is quite small and the padded is not thick, which can make you feel uncomfortable. However, you can purchase an additional seat cover – Schwinn Cruiser Gel Seat Cover – at about few bucks. The seating position is flexible as you can adjust the seat height and the handlebars angle. But, your upper body will tend to forward and downward, your both hands will grasp the front handlebars, your leg will touch the pedals under the seat. All create a nice dynamic posture to practice more effectively, which is great for weight loss and muscle training, especially upper body, hip and femur training, while still support fairly your knees and ankles. The bike is also useful for those have injured joints like any stationary exercise bikes. However, as there is no backrest, your back neither your shoulder will not be supported. You should lower your upper body in order not to get tired back too soon. Another posture is that you stand on the pedals, and get out of the seat to make the workout more dynamic that can practice your whole body. This posture is great for enhancing your stamina and muscular strength. To sum up, the bike is great for both rehabilitation therapy and musculoskeletal training. Schwinn MY16 130 has a high-speed, high-inertia flywheel to create resistance and momentum, thus, when you start pedalling, your first several rotations are quite hard. And it gets easier and smoother after every rotation, keeping you practising for hours. To create the resistance, Schwinn MY16 130 uses a Magnetic resistance mechanism. This system uses electromagnetic induction to provide the resistance, making the operation smooth and quiet. This smooth allows the bike not to cause problems for people with joint issues. In fact, many people with injured knees have used the bike for rehabilitation or general fitness and have got good results. Furthermore, you can easily adjust the level of resistance at a push of a button. There are 20 levels of tension resistance to fit all of your requirements. In the hardest resistance level, the bike is great for training your muscles and lose weight. And in easiest resistance levels, the bike is great for rehabilitation and general fitness. The components of a Magnetic resistance mechanism also have a longer life than other kinds of resistance mechanisms. You don’t have to be worried about replacing them, which will lower your cost. The solid frame and sturdy design give you a firm feeling during your workouts. There won’t be any shaking or creak, making the pedal experience really good. Combining with exciting programs, your favorite music through integrated speakers, and intuitive functions with friends through apps you will tip over into your workouts and pedal with rhythm and inspiration. Overall, this bike provides wonderful pedalling feeling. Noise: As mentioned above, the advanced resistance system and the rock-solid design make sure there is no squeak, no thumb during your practising. Your workouts will not annoy anyone or interrupt your enjoyment of watching movies/reading books/ listening to music. Heat: When practicing hard, of course, you will sweat and feel hot. But, the fans on the console produce air circulation. And you won’t feel uncomfortable and exhausted by muggy air. Dust: The design of Schwinn MY16 130 is quite simple, so you do not need to worry about dust and dirt. And if the bike is dirty, you can easily clean it with a washcloth and clean water. Once again, it’s worth to say that Schwinn featured one of the best consoles to their bikes. This bike is not a expensive one, but the console is nearly the same as the the high-class one – you can enjoy full of the great functions. This is the basic workout mode of most exercise bikes. 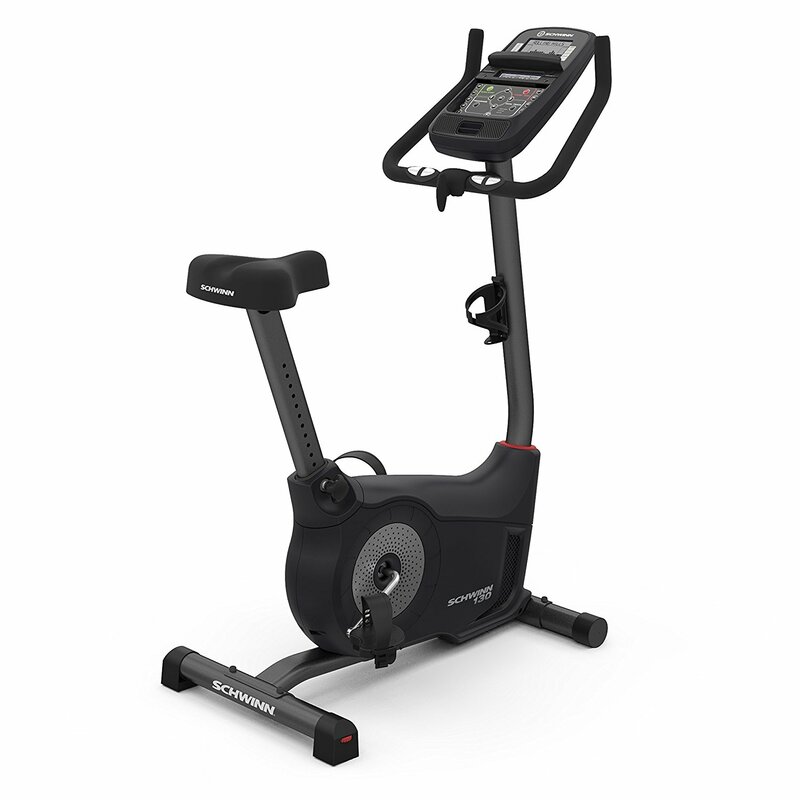 The advantage of Schwinn MY16 130 is that it provides you with 20 levels of resistance tension, giving more option and control. You can set your workout by fitness goals, consisting of distance goals, time goals, and calories burned goals. By setting goals, you can motivate yourself to reach your fitness achievement effectively. The Fitness Test measures the improvements in your physical fitness level. The test compares your power output (in Watts) to your heart rate. As your fitness level improves, your power output will increase at a given heart rate. 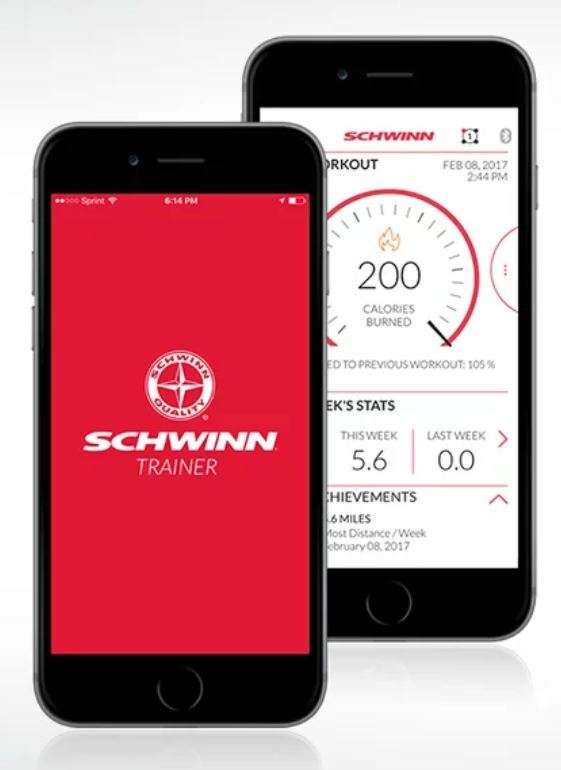 The dual track monitoring system on Schwinn MY16 130 allows you to watch your tablet for music/movie enjoyments or read your Kindle while also monitoring your training data. Schwinn MY16 130 uses electric power for the console and resistance system. So, you need to plug the bike into a standard electrical wall outlet on a 110V-120V circuit, otherwise, the bike won’t work. It costs you few hundred dollars to purchase Schwinn MY16 130. For me, this is a reasonable price for this wonderful machine. You can pay an additional cost for an Exercise Bike Assembly Service Package if you don’t feel like to assemble it yourself. In fact, it’s quite hard and time-consuming to assemble this bike, thus, if you don’t have extra hands to help you, you should consider this option. In my perspective, this bike deserves a high rating. However, it seems that many compared it to a high-class exercise bike, also many complained about the quality control. For example, one said the fans make a racket like the moving part is hitting something and the handlebars are not so firm, or one said that the heart sensors didn’t work, or of course, the assembly is so hard – and many problems they had came from the bad assembly section. These issues all belong to the manufacturer, I don’t know why there are too many little mistakes like that – Did they reduce the product quality control section for a cheaper price? However, these issues can be solved easily by detecting soon – in warranty time – and requiring a replacement. Despite this trouble, It’s still a good deal after all. Schwinn MY16 130 is a wonderful upright bike with a reasonable price. It can be considered that this is the best upright bike in the given price. By committing to exercise using this bike, surely you can improve your general health and stay fit. It is also good for physical rehabilitation/physical therapy treatment.